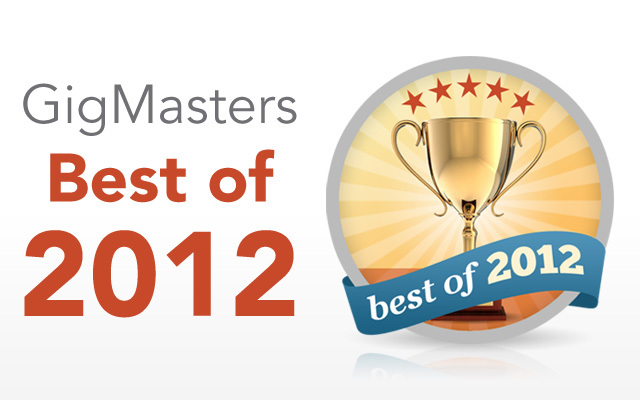 Today we’re excited to announce the release of our ‘Best of 2012’ awards! This new annual award is given to GigMasters members who have received five or more client reviews (of four stars or higher) over the course of the last year. We wanted to recognize those of you who go above and beyond to satisfy your clients because, at the end of the day, that’s what it’s all about. We have notified all qualifying members and distributed the award image to their profile pages. To see this live in action, check out Rick Torres' profile and you'll notice our fancy new Best of 2012 badge on the right side. 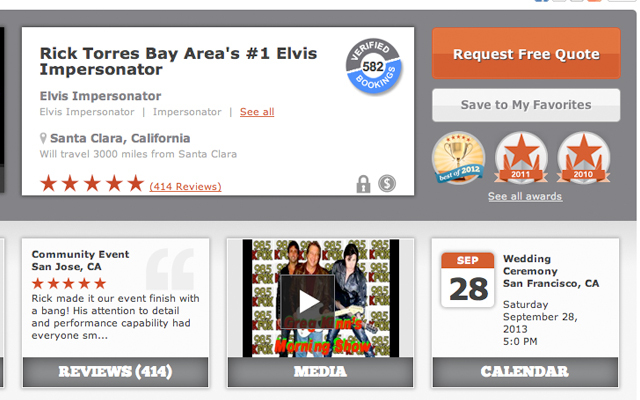 As one of our busiest Elvis Impersonators, Torres actually earned 92 client reviews (!) from GigMasters bookings this past year. The same thing goes for most of the other winners -- they flew past 5 reviews earlier in the year. First of all, keep up the good work and make sure that you confirm your gigs with GigMasters. This way your clients can verify the booking and review you after the event. You need five reviews that are four stars or higher throughout the year. We will be looking at all bookings from December 1, 2012 to December 1, 2013. Best of 2012 example - notice the award on the right side under "Save to My Favorites." Please note: This is different from our Rising Star Awards, which are determined by the highest booking dollars per category. The winners of Rising Star will be announced early 2013.